Everton boss Roberto Martinez says his side want to beat Manchester City to strengthen their European hopes rather than do Liverpool a title favour. City will secure the Premier League if they win their remaining three games. But a slip at Goodison Park on Saturday will hand the initiative back to Everton's city rivals Liverpool, who play at Crystal Palace on Monday. "Helping other teams is not the way we do things," added Martinez. "We focus on trying to win for ourselves." Liverpool finished seventh in the Premier League table last season. Should Brendan Rodgers's side win the title, they will become the first team to go from seventh to title winners since... Everton in 1985. The previous season the Toffees had finished behind Arsenal, QPR, Manchester United, Nottingham Forest, Southampton and Liverpool. Everton, who start the penultimate weekend of the season fifth in the table, still have a mathematical chance of securing a top-four finish and a qualifying spot in next season's Champions League. Arsenal are currently fourth, four points above the Toffees, who still need points to be certain of a Europa League spot. Liverpool lead the table but need a favour from their neighbours as City, three points behind and with a superior goal difference, have a game in hand. Martinez says securing a European place is all he is thinking of ahead of City's visit - Everton's last home match of the season. "It is going to be a phenomenal test and we want to finish really strong at home," said the Spaniard. "I always felt the relationship between the two clubs [Everton and Liverpool] in the city has had incredible chapters and this would be another fascinating chapter. "There is no doubt of our integrity - we want to win every game we go into. "We are looking at ourselves because these are precious points. We can't afford not to give everything we have." Everton will be without in-form midfielder Gareth Barry, who is ineligible to play as he is on loan from City. The 33-year-old has appeared in 31 league games this season, scoring three times, since moving from Etihad Stadium in September. 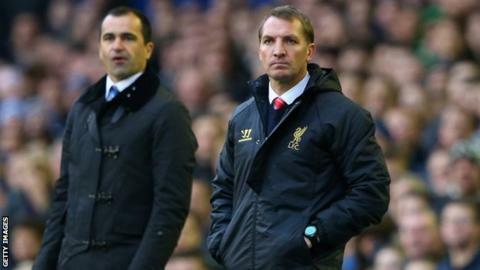 Martinez feels the Premier League should fall into line with Europe when it comes to loan rules. Chelsea goalkeeper Thibaut Courtois was allowed to play for Atletico Madrid against his parent club in both legs of their Champions League semi-final. The 21-year-old produced a vital save from John Terry as Atletico won 3-1 at Stamford Bridge on Wednesday to reach the final. "Domestic rules should be the same as the European laws," added Martinez. "It is a decision you make in a window and I don't see it as a healthy way to treat a loan player in not letting him play against his parent club."